Note to editors: There are four maps associated with this press release. 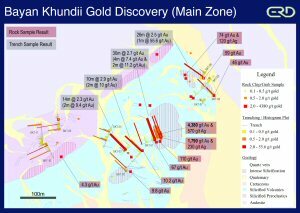 Erdene Resource Development Corp. (TSX:ERD) ("Erdene" or "Company") is pleased to announce a significant discovery of a high-grade gold prospect, Bayan Khundii (Rich Valley), on its 100%-owned Khundii exploration license in southwest Mongolia, located 15 km south of the Company's Altan Nar gold project. "We are very excited by our new discovery in this emerging gold district in southwest Mongolia. What sets this discovery apart from our other projects in the area is the bonanza gold grades, the multiple broad mineralized zones, and the free-gold, low sulphide nature of the mineralization, all of which enhance the potential economics of the project," said Peter Akerley, President and CEO of Erdene. 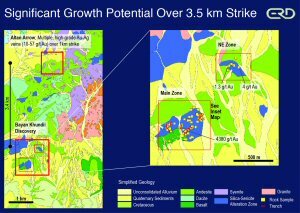 "We are now developing plans for accelerated exploration of this exciting new discovery as part of our southwest Mongolia gold development program led by our Altan Nar gold-polymetallic project." 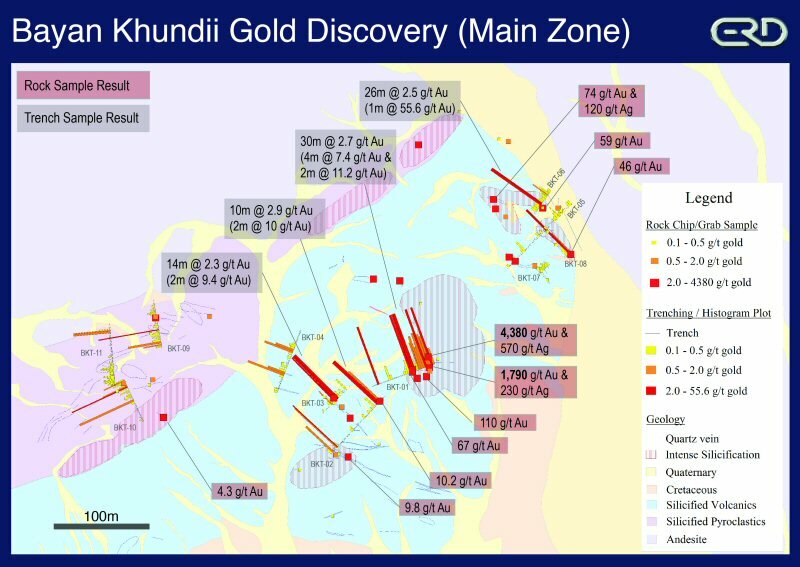 In Q2 2015, Erdene geologists conducted a follow-up exploration program on the southern portion of the Khundii license leading to the discovery of the Bayan Khundii (Rich Valley) prospect, located approximately 3.5 km south of the Company's Altan Arrow gold prospect. During Q3 2015, an exploration program was completed at Bayan Khundii consisting of rock chip/grab sampling, trenching and geological mapping. Two separate mineralized zones were identified; the Main Zone and Northeast Zone. A total of 78 rock chip, grab and channel samples were collected, principally from quartz veins from multiple mineralized areas across the Main Zone, a 550 m by 300 m area, with the majority returning highly anomalous values, and over 20% of the samples returning values in excess of 3.0 g/t gold (see table below). A map showing the sample and trench locations has been included for reference. * The samples above have been collected from both outcrop and sub-crop. The veins range from cm to 1m in width however the samples in the table above are not representative of continuous mineralized zones, although the trench results displayed below do provide continuous sampling and provide a good indication of grade and thickness at surface. A second mineralized area, the Northeast Zone ("NE Zone"), located 600 m to the northeast of the Main Zone, contains an alteration area measuring 300 m by 300 m, and returned highly anomalous results with up to 4 g/t gold. The two zones are separated by younger, possibly overlying, lithologies and recent sediments. Subsequent to the rock chip/grab sampling program a detailed mapping and trenching/channel sampling program was immediately initiated to better understand the nature and extent of the gold mineralization. Eleven trenches totaling 552 m were excavated across the Main Zone. High-grade quartz veins are hosted within volcanics that have undergone pervasive and intense silica and sericite alteration. A key objective of the trenching program was to determine if the gold mineralization was restricted to the quartz veins or if the host rock was also carrying gold mineralization. The program was successful in demonstrating wide zones of lower grade gold mineralization in the wall rock and confirming the intensity of mineralization in narrow, high-grade veins, as well as demonstrating continuity over a wide area. Table 2 below and the attached map display all significant mineralized zones. * Reported intervals represent horizontal surface intersection within trenches. The orientation of the mineralize zone, and therefore the true width, has not yet been determined. The Bayan Khundii prospect is characterized by strong pervasive silicification and sericitization that has completely replaced the primary mineralogy in the volcanic host rocks. The mineralized zones host gold-bearing quartz veins that vary in width from less than 1 cm to 1 m. Higher grade mineralization is associated with these quartz veins while mineralization in adjacent host rock varies from 0.1 to 1.0 g/t gold over wide areas. To date four separate mineralized zones ranging from 10 m to 30 m in width and averaging 2.3 g/t to 2.9 g/t gold at surface have been identified (trenches BKT-01, BKT-02, BKT-03 and BKT-06). These results demonstrate that the gold mineralization is not restricted to narrow high-grade veins, which has important implication on the potential size and economic viability of any future development of the project. In the host volcanics, gold mineralization is associated with silica and sericite alteration and fine quartz veinlets. 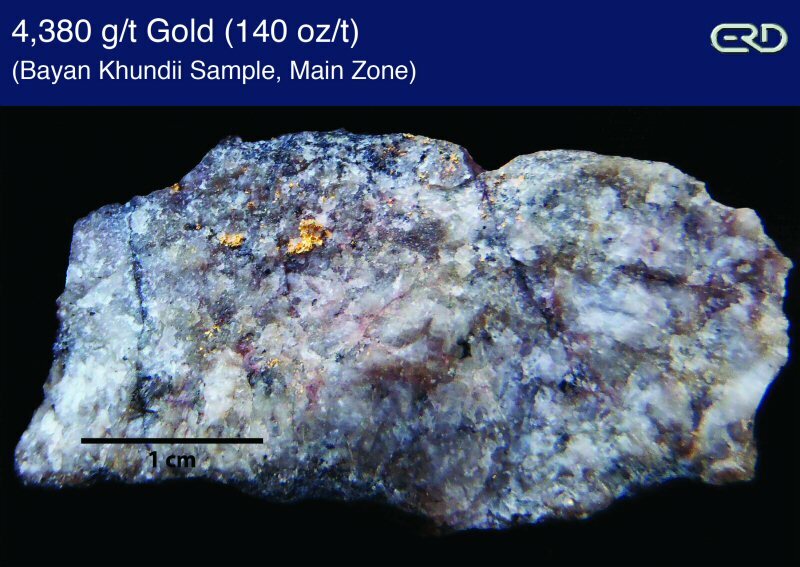 Gold was observed in many locations as irregular shaped grains, up to 2 mm (see attached photo). Gold grains are often located along vein boundaries or in centerline veinlets. Additional exploration of this new high-grade gold discovery is now in the planning stage and is expected to include two phases of diamond drilling in addition to metallurgical testing. The first phase of drilling is expected to be a 500 m program (6 to 8 holes averaging 70 m depth) to confirm trench results. Please see attached for maps highlighting the Bayan Khundii prospect. 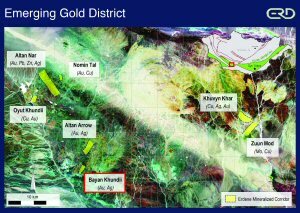 The Bayan Khundii discovery is located in southwest Mongolia on the Company's 100%-owned Khundii license, located 15 km south of the Company's flagship Altan Nar gold-polymetallic project. The northern portion of the 4,500 hectare license contains the Company's Altan Arrow gold-silver prospect where previous exploration by Erdene identified a 1 km square area of anomalous gold-silver mineralization, including some high-grade gold veins (up to 57 g/t from rock chip samples and up to 31.4 g/t over 1m in trenching). In Q2 2015, Erdene geologists conducted a follow-up exploration program on the southern portion of the license leading to the discovery of the Bayan Khundii (Rich Valley) prospect, located approximately 3.5 km south of the Company's Altan Arrow gold prospect. Michael MacDonald, P.Geo. (Nova Scotia), Director of Exploration for Erdene, is the Qualified Person as that term is defined in National Instrument 43-101 and has reviewed and approved the technical information contained in this news release. All samples have been assayed at SGS Laboratory in Ulaanbaatar, Mongolia. In addition to internal checks by SGS Laboratory, the Company incorporates a QA/QC sample protocol utilizing prepared standards and blanks. Erdene Resource Development Corp. is a Canada-based resource company focused on the acquisition, exploration, and development of base and precious metals in underexplored and highly prospective Mongolia. The Company holds four exploration licences and two mining licences located in Southwestern Mongolia. These include: Altan Nar - an extensive, high grade, near surface, gold-polymetallic project that the Company is aggressively advancing toward a production decision; Khuvyn Khar - an early-stage, copper-silver porphyry project with multiple drill targets and significant copper intersections; Zuun Mod - a molybdenum-copper porphyry deposit; and Altan Arrow - an early-stage, high grade, gold-silver project. In addition to the above properties, the Company has an Alliance with Teck Resources Limited on regional, copper-gold exploration in the prospective Trans Altay region of southwest Mongolia. For further information on the Company, please visit www.erdene.com. Erdene has 97,277,377 issued and outstanding common shares and a fully diluted position of 113,899,988 common shares. Certain information regarding Erdene contained herein may constitute forward-looking statements within the meaning of applicable securities laws. Forward-looking statements may include estimates, plans, expectations, opinions, forecasts, projections, guidance or other statements that are not statements of fact. Although Erdene believes that the expectations reflected in such forward-looking statements are reasonable, it can give no assurance that such expectations will prove to have been correct. Erdene cautions that actual performance will be affected by a number of factors, most of which are beyond its control, and that future events and results may vary substantially from what Erdene currently foresees. Factors that could cause actual results to differ materially from those in forward-looking statements include market prices, exploitation and exploration results, continued availability of capital and financing and general economic, market or business conditions. The forward-looking statements are expressly qualified in their entirety by this cautionary statement. The information contained herein is stated as of the current date and is subject to change after that date. The Company does not assume the obligation to revise or update these forward-looking statements, except as may be required under applicable securities laws.